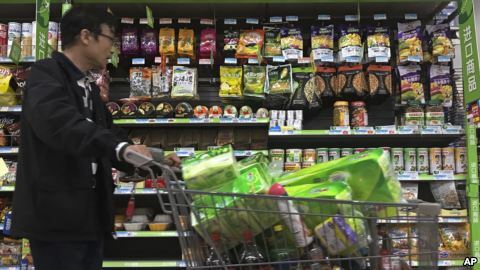 The Chinese government placed the tariffs on more than 100 products including pork, fruit and other goods. The measures are to take effect immediately. China’s finance ministry said the move was in reaction to U.S. tariffs on steel and aluminum imports announced in March. China’s most recent move adds to complex trade tensions involving the U.S., Europe and Japan. They say that China’s government unfairly supports some companies. This support, they say, is like a subsidy that makes China’s exports less costly and unfairly competitive. The group also says that state support for Chinese companies violates China’s requirements under the rules of the World Trade Organization. Foreign governments also oppose a Chinese policy requiring foreign carmakers and other companies to work with a state-owned partner. The requirement means that companies doing business in China must share technology with a possible competitor. Last month, U.S. officials said a plan by China to manufacture electric cars, robots and other high technology products was “hugely problematic.” Business groups say the plan, called “Made in China 2025” would block foreign competition within China in those industries. On March 20, Chinese Premier Li Keqiang promised there would be “no mandatory requirements for technology transfers.” But, Chinese officials deny that foreign companies are required to hand over technology. This has caused some companies to be unsure if there is a change in policy. Experts say the new Chinese tariffs on U.S. goods are likely to have limited effect. However, many in the financial industry worry about a trade war. In such a case, countries would react to new tariffs with their own import taxes, placing new barriers to trade. Stock markets in Tokyo, Shanghai, and New York all decreased on Monday. Taimur Baig is an economist with the bank DBS Group based in Singapore. He told AP that tariffs “signal a most unwelcome development, which is that countries are becoming protectionist.” But, he said the most recent tariffs are, in his words, “not very substantial” compared to China’s total imports from the U.S. However, the tariffs announced on Monday might target states that voted for U.S. President Donald Trump in 2016. Many of those are farm states. Meat stalls are seen at a market in Beijing, China. China is placing tariffs of up to 25% on US pork imports in reaction to import taxes on steel and aluminum announced by the US in March. China is placing a 25 percent tariff on U.S. pork products and aluminum scrap metal. It also is placing a 15 percent tariff on some kinds of wine, steel pipe used by oil and gas companies and many agricultural products such as apples, walnuts and grapes. It is unclear if China will make an exception for Chinese-owned Smithfield Foods, the biggest pork producer in the U.S. China imported about $1.1 billion in pork products in 2017. Experts are concerned about a new round of proposed tariffs on Chinese exports to the U.S. The Trump administration announced in March that it is preparing a list of products that could face tariffs. The AP reports that administration officials have identified over 1,000 imported products worth about $48 billion that could face additional tariffs. Trump has promised to reduce the U.S. trade deficit with China which reached a record of $375 billion in 2017. The U.S. president said he asked China to find a way to reduce that deficit by $100 billion. Mario Ritter adapted it for VOA Learning English with reporting from VOA, the AP and Reuters. Hai Do was the editor.